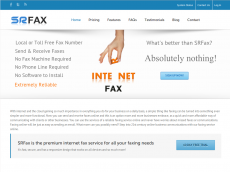 SRFax is an internet fax service provider offering email to fax, fax to email, and web based faxing with excellent customer service. SRFax clients vary in size from individuals , small businesses, medium business to large corporate accounts. SRFax's scalability allows multiple users with multiple fax numbers under the same account. Unlimited fax storage ensures that you will always have a copy of all your faxes while you are a SRFax customer. All accounts are able to use our API to incorporate SRFax services directly into their CRM systems . SRFax also "white-labels" their product to carriers and VoIP providers. SRFax also features industry standard security options including SSL/TLS transport and PGP security for faxes. SRFax has an excellent reputation for service and the ability to tailor our service to suit any of our clients needs. Local and Toll Free numbers are offered at no additional cost to the client. If you use or have used SRFax in the past, please share this page using the buttons above and be sure to leave a rating and review of the service so other people can make an informed buying choice based on your experiences! It's free and you are not required to register! If you have experience with SRFax, we kindly ask that you please share your thoughts with others on this website by submitting an honest, detailed review. Your feedback will help prospective clients decide which service provider to choose and is incredibly valuable to the community itself as well as SRFax's representatives that read this website. Please do not use this form for support inquiries. Be aware that these reviews may also be syndicated and displayed on SRFax's website, and as such a strict review policy is in effect. All reviews are moderated prior to being published, and reviews that do not contain concise, detailed comments or do not support their associated ratings will not be published. We urge you to be as detailed as possible when leaving feedback, as SRFax may also use this information as feedback for their business and are themselves encouraged to reply to reviews posted to their listings. I wanted a simple email based solution to replace my physical fax machine. I also needed more than 5 users. Several other solutions were overly complex or only allowed 5 users. SRFax was both simple (we use it as a pure email based solution) and allows up to 10 users. Perfect! Been using the service for about a month and so far very pleased. It is doing exactly what I needed it to do. Very easy to use with a few different options for sending faxes. I do not use faxes often but when I do I want ease of use. SRFax provides that. I like the Fax to Email feature and PDF fax downloads. I have used a different fax service in the past but SRFax offered more features and it was very easy to send an important fax when it was needed. I am still a new user, 1 month, but I will be continuing after the free trial ends. It works for me and I am a satisfied customer. New user - very pleased thus far. I converted to SRFax after long term unsatisfactory reliability of Fax using Ooma VOIP line. Love this service. Moved to it after having continual issues with Fax over VOIP. The "Print to Fax" is especially useful. Opened a new office recently and opted not to install copper phone lines for fax. We have SRFax set up with two fax numbers on two MFP devices and so far everything is perfect. Employees use the faxing function on the MFPs just as if they were connected to a regular land line, with the added bonus of being able to easily send faxes from their desktops and retrieve incoming faxes from a shared mailbox. The cost savings alone justify using SRFax, but the HIPAA compliance and additional features make it even better. I will say that I have recommended this site to all my colleagues. We have recently been given an opportunity to work from home and the ability to fax was one of the criteria. SRFax was the perfect solution and I was able to test it both from home and work! Once or twice now I have gotten a failed message and it was a result either a bad fax number or I resent and it went through without further issue. The fact that you can get a dedicated fax number to receive as well as send is a huge plus. This is a very user friendly website and I was able to register and start using immediately which is not the case if you try and put in a landline and hook up to an existing printer. Not to mention the affordability verses a the cost of a landline. I have not had a need for customer support and I have been using the system for over 2 weeks. I am in my 60-day trial period which will help me to gauge the approximate number of pages I will need per month and I will adjust my plan accordingly. We are happy with this services, no complaints. I've had this service for years and never a hiccup. Before this service I was using the old Fax machine and dealing with misfeeds, jams, costly ribbon spools, incomplete sends, etc ... you get the picture. SRFax has taken all the frustration away and kept me up-to-date in the digital world ... did I mention that I love this service! I'm happy. It works and it's easy. They took the time to make my pre-existing toll free number work with their system. Great price as I only get about 25 faxes a month if that. The days of the fax modem in our pharmacy is gone. Now our pharmacy software interfaces with SRFax and we have zero problems. Fast and useful replies to some questions getting started. Easy to use. I used a higher-priced competitor of SRFax for a number of years. My my fax traffic has been steadily dropping off, but I am not yet ready to give up having a fax number altogether. While looking for a replacement service, I found SRFax, and was pleasantly surprised to learn that not only was it a fraction of the price of my old vendor but had even more features. It could not have been any easier to set up and work with. Many thanks and kudos to SRFax for a reasonably priced great product that just works! 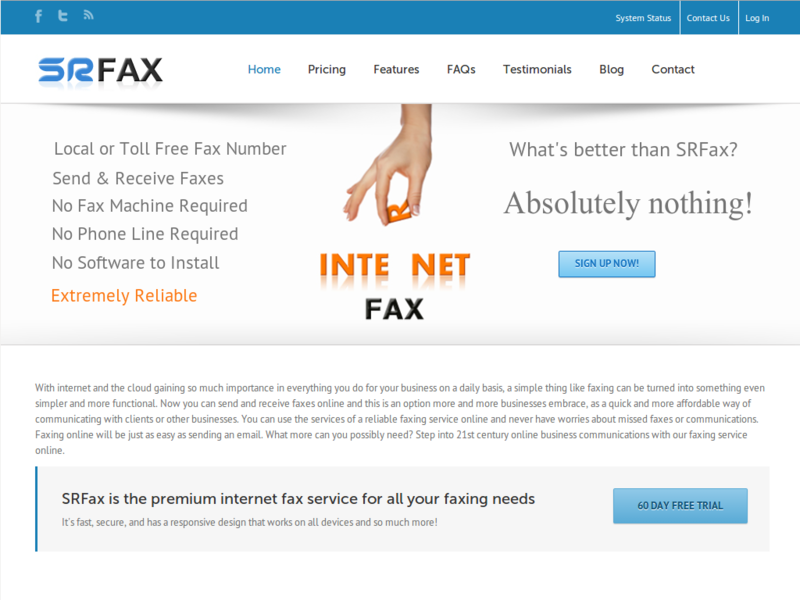 We are completely satisfied with SRFax replacing our dedicated Fax line and physical machine. Thank you! Not a heavy FAX user, but this works well, easy to use and reliable. SRFax - A Great Service! A Great Company! Simple, no issues, and great price for the great service! Thank you! What a relief - one less thing to stress about! Trial is great so far! SO far, I cannot see changing anything in SRFAX! Everything has worked flawlessly! Unless they start raising their rates by triple digits like the last company I was with.